With the help of Elvis Costello, Paul McCartney began his comeback with 1989's Flowers in the Dirt and 1993's Off the Ground. 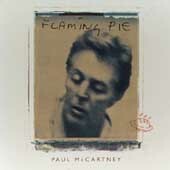 The Anthology project completed the circle for McCartney, and Flaming Pie, an album which compares favorably with his self-titled 1970 debut as well as the phenomenal Band on the Run, is the result. From the opening chords of The Song We Were Singing, you can tell McCartney is back, and Flaming Pie improves with each passing track. Jeff Lynne assists with some of the production work, but McCartney keeps him in check. In fact, Lynne had nothing to do with the song that sounds closest to Lynne's typical production style: Young Boy. Steve Miller lends a hand on If You Wanna, Young Boy, and Used to Be Bad, giving the songs an extra punch with his stinging, blues-based electric guitar work. In addition, George Martin scored some beautiful orchestral accompanments for Somedays and Beautiful Night, and he gave Calico Skies his magical touch. McCartney held nothing back in pulling Flaming Pie together. Enlisting the help of old friends, he carefully crafted his best batch of songs in 27 years, thus forging another gem for a canon that, even with its ups and downs, already had quite a few of them. Flaming Pie is available from Barnes & Noble.